The Chicago Cubs have always been irked by the owners of rooftop viewing stands in the neighborhood overlooking Wrigley Field. 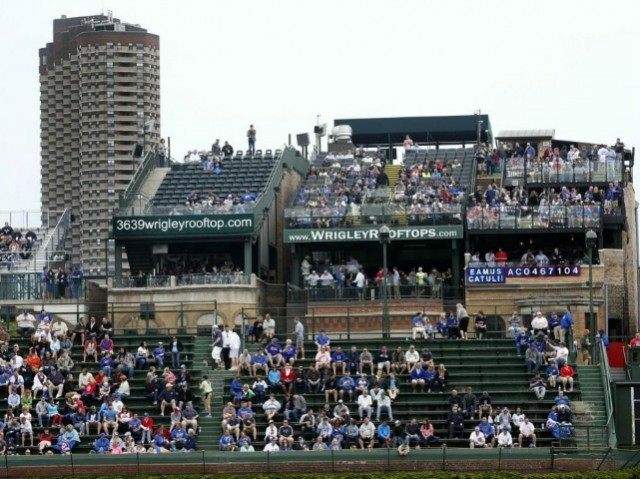 In what rooftop owners insist is an effort to put an end the problem, the Cubs announced that as part of its stadium remodeling they were erecting new signs that would block the view of neighbors’ rooftop seating. Edward McCarthy, who represents the group that runs two rooftop businesses—Lakeview Baseball Club and Skybox—filed a federal lawsuit accusing the team of “anti-competitive behavior.” The lawsuit also claims that the team has violated the 20-year contract that granted permission for the rooftop companies to view the game. McCarthy says that if the signs are erected it will destroy their businesses. He wants a judge to put a halt to the Cubs’ plans. “Simply put, without views into Wrigley Field there is no rooftop business—a fact that the Cubs organization has frequently pointed out while trying to strong-arm the plaintiffs and others into selling out,” the lawsuit says according to the Chicago Tribune. If a court grants an injunction to stop the signs, it will further delay the $375 million refit of Wrigley Field. Already the Cubs have admitted that the construction won’t be complete for the April 5 season opener. According to a 2004 agreement with the rooftop owners, the team is prohibited from obstructing the view from the buildings across the street from the stadium’s outfield. The agreement is supposed to be valid until 2023. Even without the new signs obstructing their view, several other rooftop businesses have come into financial distress. Two have sold out to the Ricketts family, owners of the Cubs, and a few others are in debt and facing possible foreclosure. As a result, many in Chicago feel that the tradition of rooftop viewing of Cubs games is one that is about to become ancient history.